We are pleased to announce that the 2019 Concept Grants program is now open for applications. Now in its second year—learn more about the inaugural winners here—the Concept Grants program funds innovative software ideas that support social science researchers to work with big data and new technology. We have a small number of grants available, up to a maximum value of $35k (or £25k). Deadline for applications is 15th February 2019. Through the Concept Grants program, we are looking to support early stage software ideas, particularly those that include a plan for sustainability and/or that have future commercial potential within the academic market. We will look favorably on ideas that have wide-scale applicability within the social sciences and that will help further SAGE Ocean’s mission to equip social scientists with the skills, tools, and resources to work with big data and new technology. Last year the SAGE Ocean Concept Grants were awarded to Quanteda Studio, LSE UK, MiniVAN, Public Data Lab, FR/UK and Digital DNA Toolbox (DDNA), IIT/CNR, IT. 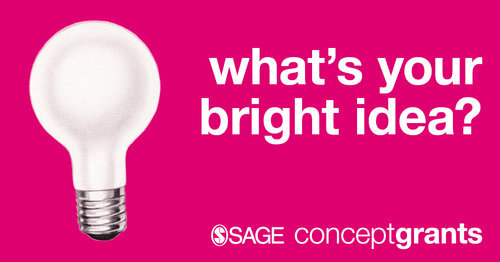 Read more about last year's winners on the SAGE Ocean blog. We firmly believe that current problems related to the assessment of credibility and reliability of content (and content producers) require a multidisciplinary approach. To this end, this funding will contribute to bridge the gap between big data and social scientists, empowering the latter with state-of-the-art algorithms and analysis techniques that would otherwise be confined within the computer science community. We look forward to working together with SAGE and other social scientists in order to deliver efficient, easy-to-use tools, and to make an impact on our society." Want to know more about the DDNA Toolbox and how they've taken inspiration from biological DNA to model online user behavior? Read their recent blog post. To apply download the below form and follow the instructions to submit your application. The deadline for applications is 15th February 2019.